Works by Ba Lwin (1928-89) are very rare. Ranard (2009, p. 192) comments that he is aware of only three such works by the artist. This painting makes a fourth. 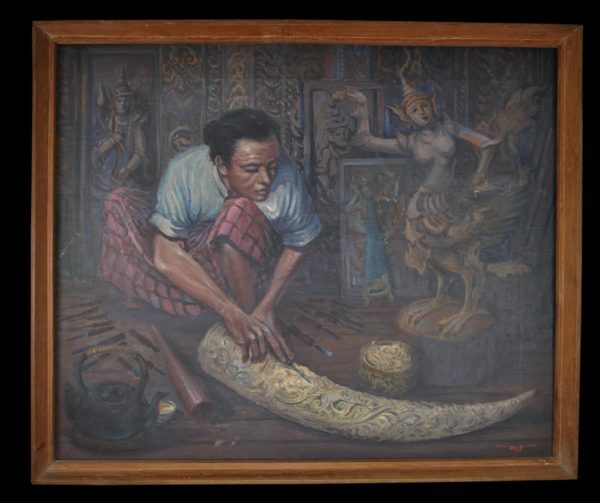 This fine oil on canvas shows an ivory carver, in traditional dress, at work in his workshop. He works a thick tusk with a chisel, and around him are more chisels. A kettle is in the foreground, perhaps to hold hot water to soften the ivory. Nearby is a statue of a celestial deity and behind are heavily carved wooden panels. 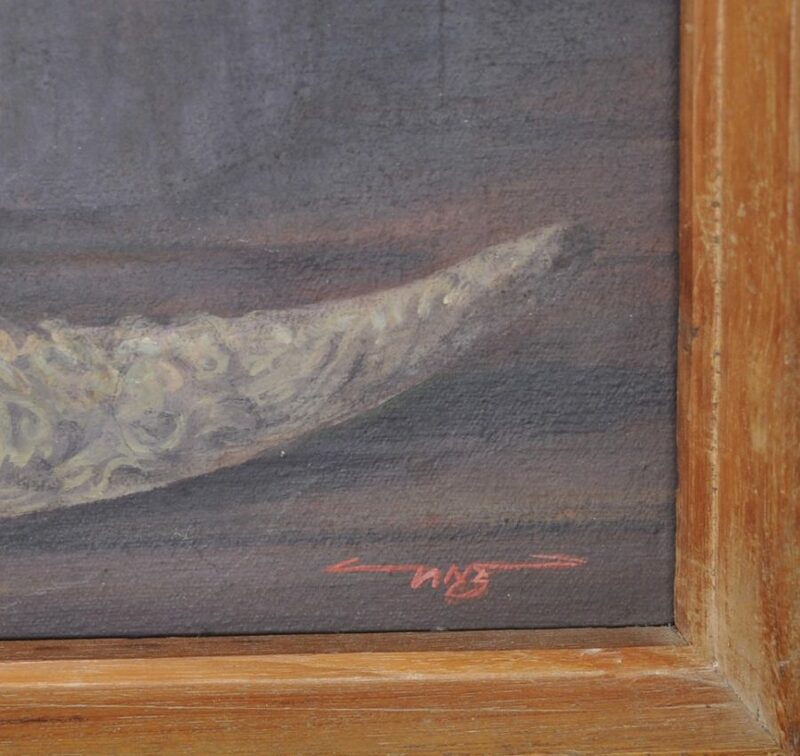 The bottom right hand corner has a brief signature or monogram in red paint for the artist. The carving of ivory was one of the many traditional crafts that reached almost unparalleled heights in Burma in the 19th and early 20th centuries. According to Tingley (2003, p. 88), ivory was boiled in a solution to make it soft prior to carving. The design was outlined in charcoal on the ivory, which was then chiselled, filed and polished. Most of the ivory used in Burma at this time was sourced from the Shan States. Typically, elephants were not killed for their ivory; they were too valuable alive to be used for transporting logs and other heavy items. Instead, most local ivory used in Burma was from elephants that died naturally. The gift of carved ivory to a temple or monastery was a particularly meritorious act. Ranard (2009, p. 193) illustrates one painting by Ba Lwin, which is similarly dark and of similar size. 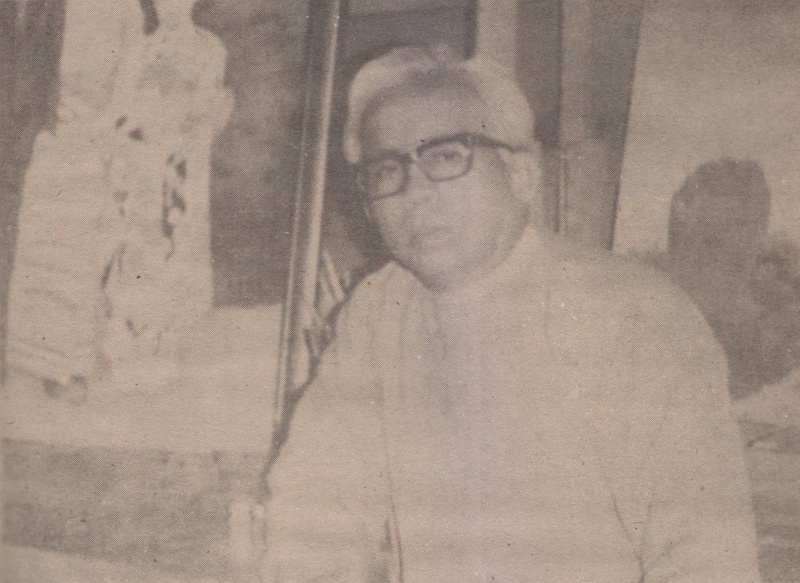 He says that Ba Lwin was a soldier and a political activist as well as a painter. He joined the anti-British youth league in his early days and in the Second World War spied on the Japanese on behalf of the Burmese military forces. The final image shows an old photograph of the artist. 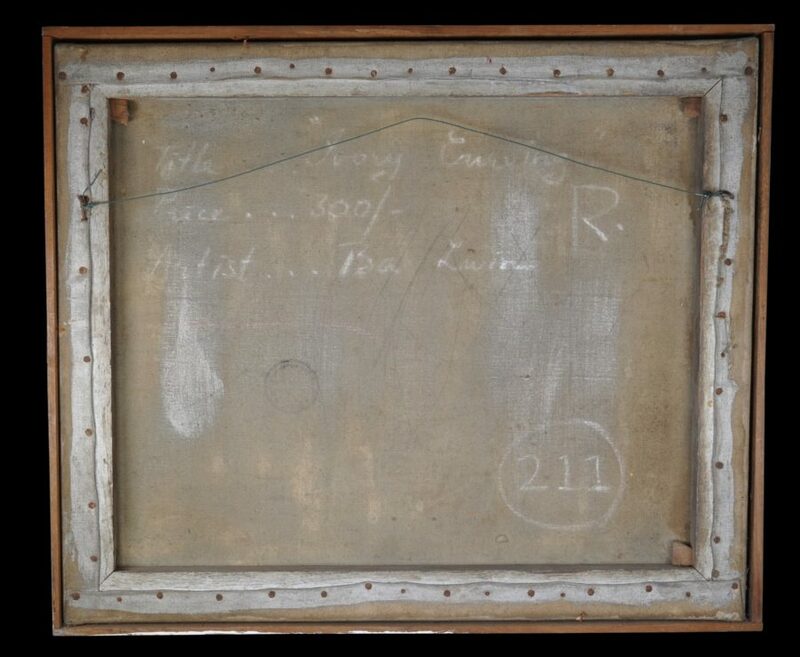 The canvas is on its original wood stretcher and probably in its original wooden frame. The surface appears in good condition. There has been no cleaning or restoration.